Here’s one for UK visitors only: an ends-on-November-30 offer from Corgi. It’s for free post and packing on anything you order. It’s something of a tempter, especially if you’re already thinking about placing an order. Corgi’s online shop is full of interesting diecast goodies - the 1:50 scale truck range continues to be a success story, as does the 1:36 scale James Bond series. These are attractively packaged in book-style boxes, with the Pierce Brosnan set a nicely crafted vehicle duo. This one packs the Aston-Martin Vanquish and Jaguar XKR which featured in the movie Die Another Day, one of the best of the newer Bond movies in SMN’s opinion. Not that you have to agree of course - we all have our faves! The set packs a nice addition, a set of four movie posters: Die Another Day, GoldenEye, The World is Not Enough and Tomorrow Never Dies. All boxes are individually numbered. 1 Corgi 1:50 scale trucks. 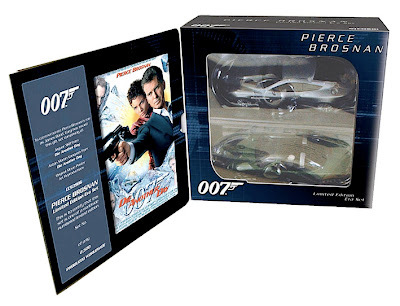 2 Pierce Brosnan 1:36 scale Bond set. Have a look at the Corgi online shop here. And there’s a host of James Bond items here.